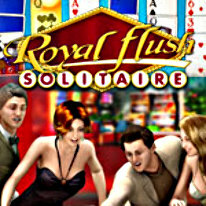 Royal Flush Solitaire is a unique crossover game and combines elements from poker and solitaire. Royal Flush Solitaire is a unique crossover game and combines elements from poker and solitaire. Royal Flush Solitaire offers its own gameplay experience that is different from any known solitaire game. To advance from one level to the next, players must clear all cards off the board by building poker hands, such as a pair, full house, four of a kind, or a royal flush.